I discovered personal color analysis while trying to minimize my wardrobe. Many of the experts on minimal and capsule wardrobes talked about color and I started to realize the importance that color has to appearance. I always new that I looked terrible in brown, but I didn’t know the effects that even subtle changes in colors have on our appearance. I now know that the right brown is actually one of my best colors – who knew?! My personal color palette showing my best reds. In a nutshell, when you know your seasonal color palette – the colors that are harmonious with your natural coloring – you look your best. Like the colors you are wearing belong to you. On the other hand, when you wear colors that are disharmonious, your imperfections (wrinkles, blotchiness, dark circles, etc) are more highlighted. If you’re not convinced by “look younger without Botox,” read on for the five ways Personal Color Analysis can be life changing. Our best colors are in harmony with our natural coloring. When we wear them, we look authentic and put together. This puts you in the spotlight versus what you are wearing. After my personal color analysis, I noticed that the way I received compliments changed. Previously I’d hear things like, “I love that outfit” or “That’s a great color!” Once I was analyzed and started wearing my colors each day, I would hear things like, “You are glowing” or “You always look so put together.” The compliments I receive now are much more meaningful. Shopping has become less stressful, easier and cheaper. I used to go up to a stack of Target t-shirts on sale 2 for $14 and just buy a white and a black out of habit. If they were on sale 3 for $20 then I would add a color at random – whatever was pretty. Now, I walk up to that same rack, pull out my handy custom color palette, and determine whether any of the t-shirts are in my palette. If they are, then I try them on to see if the style works with my body shape. If they aren’t, I walk away. I have literally walked out of stores happily spending nothing. The purchases I do make, I reevaluate when I get home and return them if they aren’t right. Which leads us to reason number three to invest in a personal color analysis. 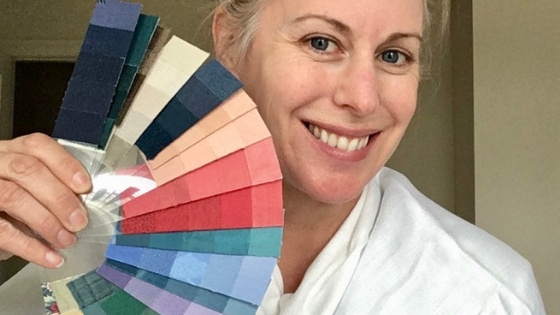 Having a custom color palette can give you a framework for building a wardrobe of colors that all harmonize with you; and therefore, with each other. When I take my Target shirts home, I hang them with like colors and step back. It is so easy to see which ones are out of alignment, and they get returned. Some might think having a specific color palette is limiting, but I actually find it freeing as I’ve tried so many more colors and color combinations. Although I minimized my wardrobe after my analysis, I actually found that I have more to wear and feel good in all of my clothes. For easy steps to clean out your closet and maximize what you have, you might read this post. I would have never thought of this as a benefit in my past. I was that girl who absolutely loved makeup and constantly added to my collection – always looking for the next best thing. Shrink the makeup drawer? Which one? I wouldn’t have thought it possible, but then I received the best compliment ever. When my aunt came to visit, she said, “I notice you’re wearing less makeup. You look a lot younger.” Yep. Sold. The interesting part is that I wasn’t wearing less makeup; I was just wearing the right makeup (Post on using your color palette to choose makeup). In a word. Confident. This has been the most profound impact for me. Too often in my past, I looked in the mirror and didn’t like what I saw. I noticed all of my imperfections instead of my inner beauty. I used to say that I looked terrible without makeup. That I couldn’t see my eyes and my nose looked really red. After my personal color analysis, I figured out that the reason you couldn’t see my eyes without makeup was because I was always wearing black, which overpowered me. Now I’ve probably scared you off from getting analyzed, because you don’t want to potentially give up your favorite color. Fear not. I remember discussing (read arguing) with my analyst about wearing colors out of my palette as shoes and pants. She gently (I was upset due to my closet full of black) recommended that new purchases be made in my palette as my outfit will harmonize better. After a few weeks of wearing only my colors, I was adamant that I would not give up my rust colored jeans (read expensive and so cute). I paired them with a gray top and headed off for my day. Honestly, I felt out of sync the entire day. I know that sounds weird, but that’s how I felt. I sold those jeans in a New York minute and got rid of everything in my closet that wasn’t in my palette. I’ve since matured. I now know how to strategically style colors outside of my palette to make an impact, but still feel in harmony with my natural coloring. Personal color analysis did not cure me of all of my insecurities, but I can happily say that it did help me feel more comfortable in my own skin and much more confident about my appearance. I can honestly say that I like what I see in the mirror these days. Best investment in myself I ever made! 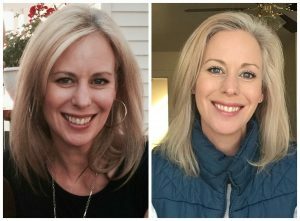 My before and after pictures – I am four years younger in the first picture, but don’t shine very brightly in a black shirt and warm makeup. I love this! You are beautiful inside and out! Hi Stacey! I can’t wait to do your colors! We can try online once I’ve perfected the virtual process or wait for a visit! Hi Shannon, this is awesome and I would love a color consult. When will you be in California? Christmas? Let’s do it! Yeah! I would love to book you for the 22nd or 23rd! Hi Shannon! How much is this analysis and please let me know when your online analysis is functional! I love your blogs. Hey Michelle! I’m so glad you are finding the blogs interesting and helpful! I’ve been doing Virtual Analyses for a few months now and they work great! You can find the pricing under services, but I will send you an email with more detail of what all is included and how it works.